Watch out, quinoa: There’s a new grain in town. Although it’s only new to America; freekeh dates to about 2300 B.C.E. 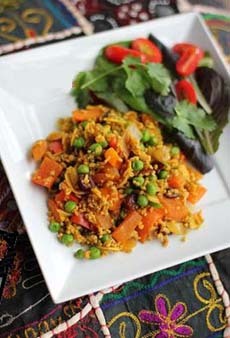 As the story goes, freekeh was created by accident when a Middle Eastern village was attacked. The hostiles set the fields of young green wheat blaze. After the enemy departed, since food was hard to come by, the villagers rubbed off the burned chaff, cooked the immature kernels and discovered that the grain had a smoky aroma and a nutty taste. A cross between brown rice and barley, freekeh became popular in the cuisines of Egypt, Jordan, Lebanon and Syria. Freeheh has great nutrition and great versatility. You can use it in place of rice or any other grain, even down to making freeheh empanadas, jambalaya, paella, tacos, and even freekeh sushi. Freekeh Foods makes three freekeh varieties, original and first flavored freekeh we’ve seen, rosemary sage freekeh and tamari freekeh. freekeh. Photo courtesy Freekeh Foods. If you’re always on the prowl for the new and delicious, get your freak on with freekeh. Read the full review. Who wouldn’t want a box of new smacks each month? Photo by Elvira Kalviste | THE NIBBLE. 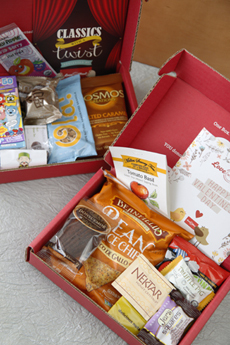 Our Top Pick from last week was a gift suggestion: a snack-box-of-the-month club. We’ve encountered two companies that have entered this space, both serving up artisan snacks that are a delight to discover. Each month the recipient receives an assortment of all natural, typically good-for-you snack foods. The choices come from a broad selection of fruit bars, veggie chips, teas, cookies, candies, peanut butter and jam, nut and seed mixes and other yummies. Love With Food combines “great food for a great cause,” donating one meal to a food bank for each snack box sold. Boxtera aims for a high percentage of organic-certified products, and strives to include products that are gluten free. Both are wonderful gifts, as well as self-treats. Read the full review.